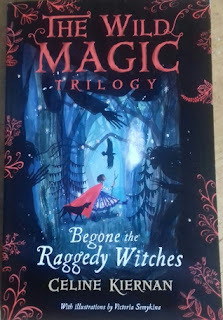 When her father gets kidnapped, young Mup, with her mam, baby brother and dog, travels into a fantasy land ruled by an evil queen (who is also her grandmother). It is a land of dark forests and magic, where people turn into animals and live in fear of the Queen's enforcers - the raggedy witches. They are a terrifying spectacle, as is their queen, who towers over the narrative like a dark shadow, much like the White Witch in Narnia or Lord Voldemort in the JK Rowling books. Mup herself is a courageous quirky little thing, full of spirit and her own blend of magic. The action hurtles along from one fairytale event to another, culminating in a high drama, cinematic denouement at the Queen's castle. The writing, as you would expect from Kiernan is flawless and beautiful. She is a most welcome addition to the middle-grade scene and if this is anything to go by, kids from 8-12 are gonna hear a lot more about Celine Kiernan. An impressive debut for this age range - made all the more appealing by a stunning cover. I also love the title, and the names of the characters. The book is a cross between Narnia, Abi Elphinstone's The Dreamsnatcher with a sprinkling of Tolkien and Grimm.